Charminar (char= four, minares= spire or tower, in Arabic) is the definitive landmark in Hyderabad, the capital city of Andhra Pradesh. This charming structure is at once a distinctive monument and one that has special functions. (This is in contrast to most monuments, such as the Taj Mahal or Qutb Minar, which were built mainly for their appearance). It was constructed at the intersection of four roads and thus functions as a junction. The top floor is also home to a masjid or mosque. 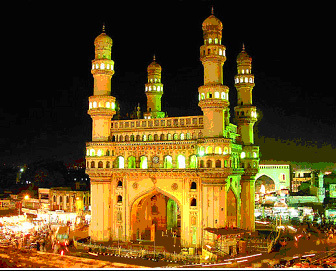 Charminar was built by Muhammed Quli Qutb Shah in 1591 after he shifted his capital from Golkonda to Hyderabad. He constructed it to fulfill his promise to Allah (in return for ending a local episode of plague) of building a masjid at the very site. Constructed of granite and limestone, Charminar is imposing in size and boasts unique and attractive features. The main structure and the four minarets both have four stories. The whole structure is square in shape, with each side measuring 20 meters. There is a minaret at each corner, and these soar to a height of another 28.7 meters. One hundred and forty nine steps will take a visitor to the top floor and which provides a scenic view of the town. The minarets have four delicately carved rings at the junction of each floor. At each side of the square is an impressive arch, each of which opens to a major thoroughfare. These four roads were used for royal processions. The arches are 11 meters wide and 20 meters high. THE BEST TIME TO VIEW THE CHARMINAR IS AT NIGHT, WHEN IT IS LIT AND THE LACE-LIKE CARVINGS AT THE JUNCTION OF EACH FLOOR OF THE MINARETS ARE HIGHLIGHTED.